Money. Sheesh! We need it to survive in this world, yet it is the cause of conflict in towns, countries, businesses and even marriage. Yes, of course, even Christian marriage. 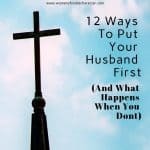 I’ve even addressed this in a blog post “Money and the Christian Marriage: 7 Tips to Avoid Conflict”. People use money as weapons and greed drives them to sins of all types. It hurts my heart when I hear about Christian marriages struggling due to financial pressure. I think it hits so close to home because in my previous marriage, we fought about money all of the time. (My husband passed away in 2012 and I spent years cleaning up the financial mess). My husband, Mike and I, never fight about money. There’s a few reasons for that, I believe. I have spent a lot of time, since my first marriage, studying budgeting, money, savings vehicles and more and am more financially savvy than I was years’ ago. We don’t fight about anything. We pray and give the issue to God. Being a single mother for years forced me to watch every penny and develop a budget and bill paying plan that worked for me. 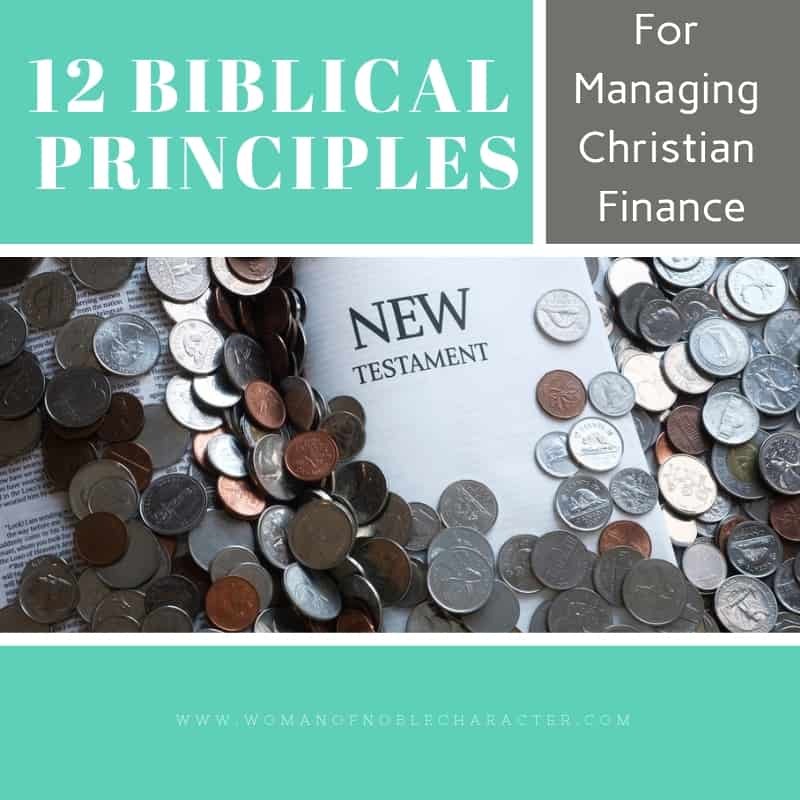 Finance and financial matters are important to everyone, but I believe that Christian finance is particularly important. Why? Because our money, our resources, are not ours. They belong to God and He has entrusted us with them to use wisely. We are to give our tithe and manage the rest responsibly. So, how do we responsibly manage our money the way God had intended for us? Remember that your money (and house, car, even your coffee maker) don’t belong to you. They are from God, who has entrusted you with them. 3. 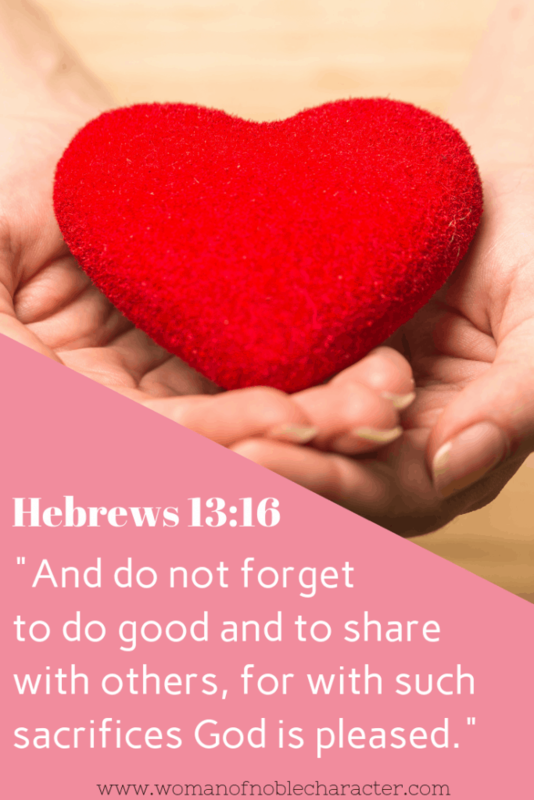 Giving is an important biblical concept. Throughout the Bible, we are called to give generously. 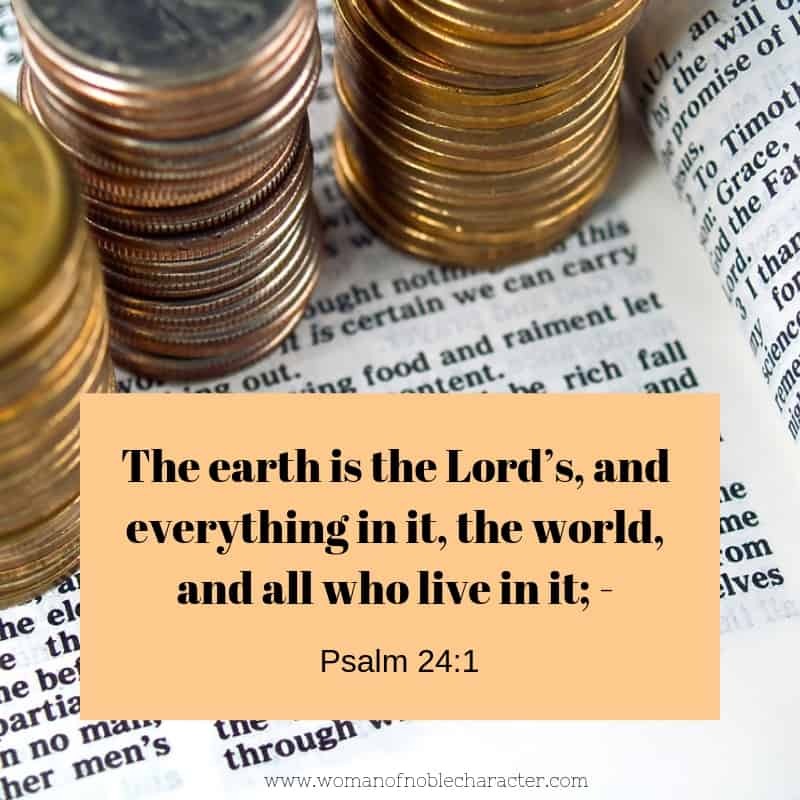 Remember that our money and possessions belong to God and not us. In Exodus 35, we see the Israelites giving generously for the materials to build the tabernacle. They give of their time, too, to build it. If the Israelites did not give what they had or help build it, the tabernacle wouldn’t have been built! And, of course, the greatest example of giving is from God, Himself. He gave us his only son to die on the cross because he loves us so very much. Give back to God what is already His. When you tithe, you are showing God that you not only follow His commands, but that you trust that He will care for you. The Christian post, reported on a study that confirmed Christians who Tithe Have Healthier Finances Than Those Who Don’t. When you tithe, you are trusting that God will take care of you. 5. Stop worrying about money. Of course, the Bible tells us not to worry about anything, but in everything present your requests to God in prayer and thanksgiving. Money is no different. Sure bills come due and the car breaks down, but worrying about these things just causes grey hair and indegestion. 6. Budget your money. When you make a plan, you are more likely to handle your finances responsibly. Knowing how much money you have coming in and what needs to be allocated for bills, helps you to spend within your means. After your tithing and saving, you know what you have left to pay bills and spend on lattes. (For more on budgeting and bill paying, including free printables, see this post). 7. Save some for a “rainy day”. This biblical money principle goes hand in hand with budgeting and staying out of dept. When you actively put money aside and build up your bank account, you are more likely to have money on hand when an unexpected bill pops up and, therefore, less likely to have to borrow. As mentioned above, it is a good practice in biblical money management to add to savings right after tithing. In our home, after tithing our 10% (or more), we put 10% into savings. What’s left is what we use for bill paying and dinners out or other “treats”. 8. Be content with what you have. It’s easy to see the friends from church buy a new car every year or wistfully “admire” the friends who just moved into a Pinterest-worthy showcase of a home. We see what others have and want the same. When I was a child, my parent’s called this “keeping up with the Joneses”. God, however, instructs us to be content with what we have. And, when we are, we are less likely to go into debt to have the things we really can’t afford, anyway. 9. Trust that God will provide. Believe God’s promises that He will meet your every need. Sometimes He’ll provide through the generosity of others. Sometimes, through our own efforts, but God has never promised to give everyone the same amount. As a believer, it’s important to accept what God has provided for you. What He entrusts to you is part of His plan that He has for you and your life. 10. Don’t help others get in debt. God says in Proverbs 27:13 to exercise extreme caution in cosigning. This verse infers that it is a terrible credit risk to take on a stranger’s debt. When a person cosigns a loan, he is the one who is really borrowing the money. The reason a person needs a cosigner is because the lender is unwilling to lend that money to the person requesting the loan. I understand helping others, but a bigger blessing would be to provide the person with sound biblical resources on Christian money management. 11. Seek godly counsel. Before buying a house, purchasing a car or taking out a loan, pray about it and seek the counsel of strong Christians, preferably those knowledgeable about Christian finance. Wise counsel can keep you from making bad mistakes. Many, choose not to seek counsel because they don’t want to hear that their decision is poor. Pride comes before the fall, they say. 12. Work hard. So often, when I hear people lamenting about their financial hardships, you learn that they aren’t working very hard to make money or get out of debt. They spend all of their time complaining, but don’t take action. There are probably thousands of ways to earn extra money. (The Master Your Money Bundle includes several fantastic resources on earning money from home, starting a side business or even living on one income). Don’t complain, work hard, take action and trust God. As I grow older and my children leave the nest, our finances are starting to look a bit different and we are looking toward the future and retirement. Times change, finance changes, but the Bible never changes. 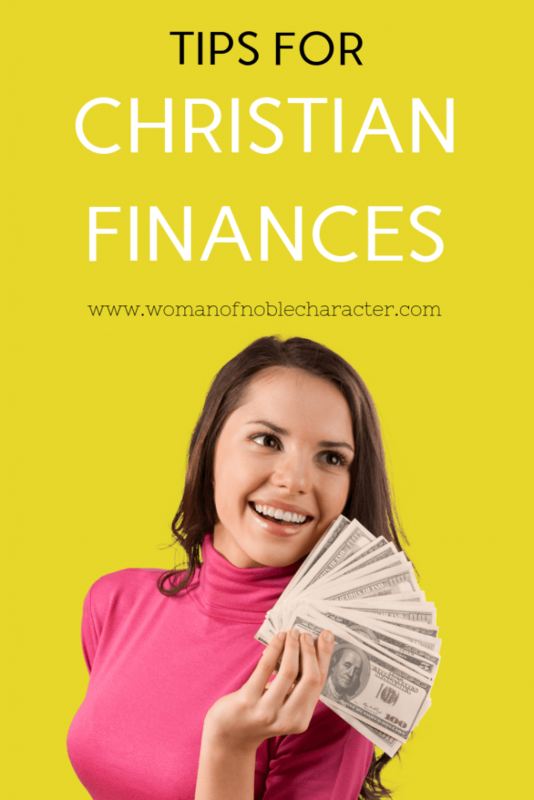 I continue to study what the Bible says about money and read reputable books and blog posts about Christian finance. I really love some of the materials in Master Your Money Bundle from Ultimate Bundles. 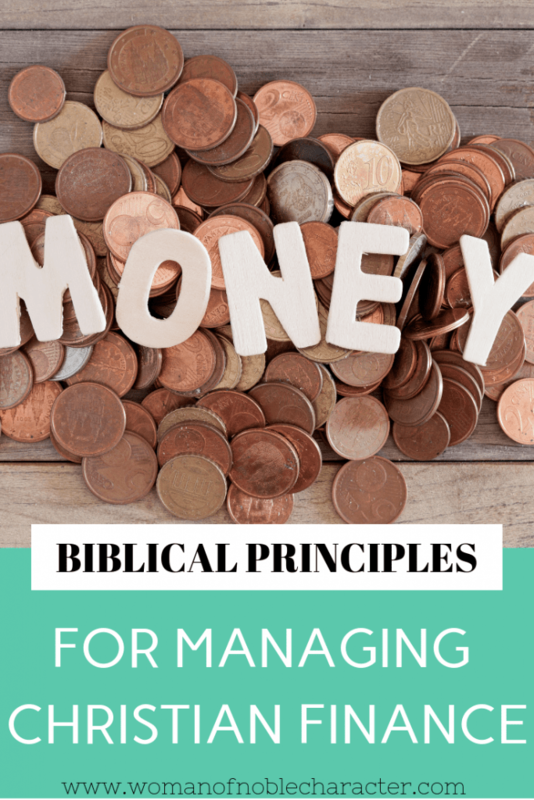 My favorites are Biblical Money Management and Managing Money God’s Way. The latter is a thirty one day devotional. Each day, focusing on a different insights, questions and discoveries on biblical money management. My husband and I are working our way through this together and love the biblical foundations for each concept. The Biblical Money Management: What to do with a Rolls Royce Lifestyle, When You Live on a Honda Paycheck. 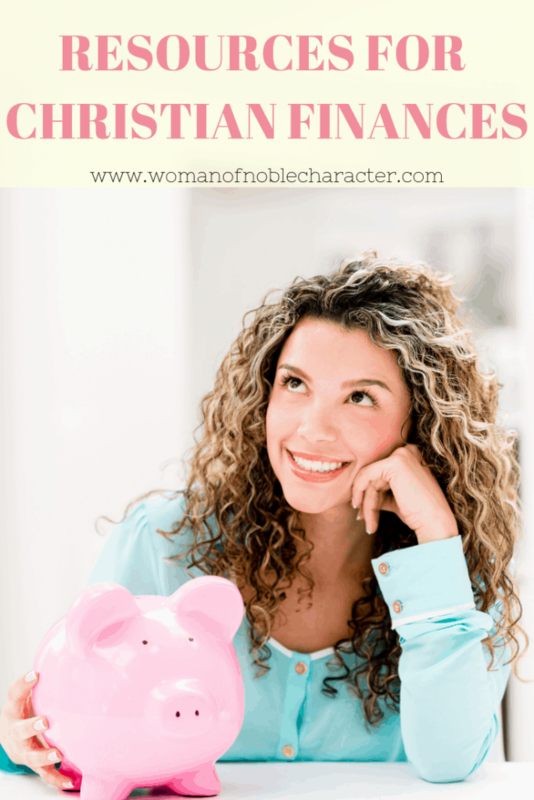 There are tons of resources on managing money, teaching your kids about money, budgeting and what the Old and New Testaments say about money. Both are solid for instructing on Christian finance. 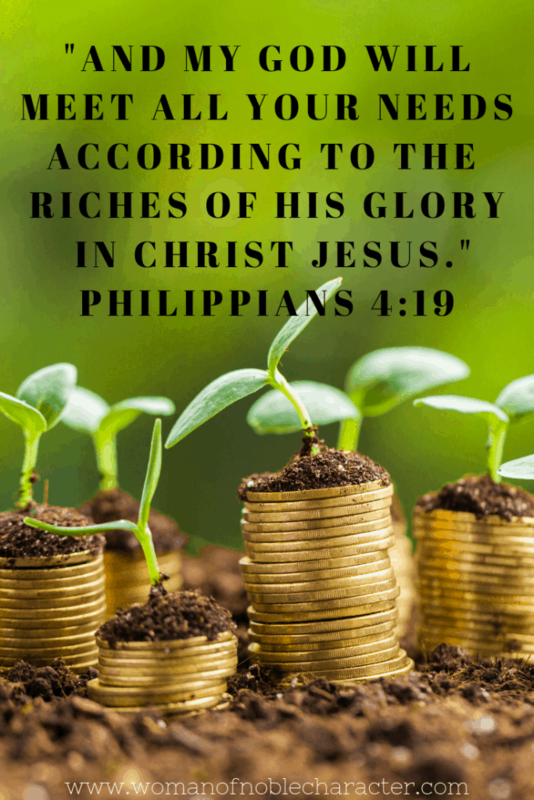 Of course, many Christians are aware of the teachings of Dave Ramsey in regarding to Christian finance, particularly Financial Peace University. I have personally used his methods for paying down debt and am an advocate for most of his books. When speaking to groups about finance for Christians, I often hear women share that they wish they could stay home with their children. To be honest, that situation becomes more difficult in our society, but it is possible. In the Master Your Money Bundle, there’s a fantastic resource titled “How to Live on One Income”. While my children are grown, I loved this ebook. The author, Apryl Griffith, shares practical advice from her experience living on one income for ten years. Much of it is great advice for any Christian marriage concerned about finance. How do you and your spouse do with biblical financial management? Where can you improve? I’d love to hear your thoughts!